DEARLY-BELOVED YOUTHS, WHO HAVE BEEN CONSECRATED TO THE SERVICE OF GOD, AND WHOM I WARMLY ESTEEM AND LOVE, as I am employed every day in addressing you personally, so I take the present opportunity of addressing you by a written communication. All my prayers, desires, anxieties, and labours are directed to this one object, that you may be properly instructed in Divine truth, and somewhat prepared for conveying it to others. You will not, I trust, be displeased at being again requested to accept from my hand a small literary gift. I wrote to you formerly, and dedicated to you my Dissertations on the Apostle's Creed. That "labour," I have had abundant opportunities of knowing, was "not in vain in the Lord." There were, and still are some persons who acknowledge that they derived from it some little assistance in explaining to the Christian people the most important mysteries of our religion, and in applying them to the practice of true virtue and ardent piety. These considerations, I am free to confess, gave me great comfort. No one was ever more deeply convinced than I am that very little proceeds from me which is fitted to advance the glory of God, or the increase of the Redeemer's kingdom. For this reason I am delighted to see other persons of higher ability devoting their utmost exertions, with remarkable success, to an object of surpassing worth. And whenever I perceive among those eminent persons some who had been placed under my own tuition, I feel myself excited to earnest gratitude and lively joy. Nor can I avoid regarding them as auxiliaries kindly granted to supply my weakness. With what zeal, earnestness, and perseverance I frequently exhort you—to seek to obtain heavenly truths from the Holy Scriptures as from the mouth of God himself,—to preserve them carefully in the repository of a pure heart,—to express your belief of them by the whole course of your life,—to remember your professions and the expectations which your parents, and teachers, and the Church of Christ have formed respecting you,—to yield yourselves, during the present season of youth, as Nazarites to the Lord, separated from the pollution of the world, and purely devoted to the holy ministry,—you cannot but know and readily acknowledge. You know also how far the course of instruction which I follow is adapted to that object. For the explanations I give you are never wasted on the trifling subtleties of laborious sophistry, or the bitterness of wrangling disputes, or the exaggerated language in which opposite sentiments are stated, or the reproaches of brethren whose views differ from our own, or the foolish announcement of my own discoveries, which I freely own to be of very little value. But those truths which I rejoice that I have learned from God,—to whom, by whatever human agency they may have been imparted, I freely ascribe them,—I take pleasure in communicating to you mildly, calmly, and with the Spirit of meekness,—endeavouring that, "by manifestation of the truth to the conscience," I may first approve myself to God, then to my own mind, and finally to you. And this manner of teaching, widely removed from all noise and pomp, though it may appear somewhat cold, wants not its own beneficial excitements, and is best of all adapted to promote that wisdom, which the Apostle James recommends, and which is "first pure, then peaceable, gentle, and easy to be entreated, full of mercy and good fruits, without partiality, and without hypocrisy. "2 If the consideration of the Divine perfections, as they shine "in the face of Jesus Christ," and of the other lofty truths which the Gospel has revealed, calmly contemplated in the light of the Holy Spirit, fail to excite a man to love them, and to "contend earnestly for the faith which was once delivered unto the saints,2 though it were even to martyrdom and to death,—that man will not be powerfully affected by the warmest disputes on religious subjects. Or, if any warmth arise, I should suspect it to be "strange fire which the Lord commanded not," and which he will not accept upon his altar. Since, therefore, that wisdom which I am desirous to teach you, or rather to learn along with you, must be asked from God in pure and holy prayer, I was easily persuaded to commit to writing the illustrations which had been orally delivered on the exercise of prayer, and particularly on that prayer which was recommended to us by our Lord Jesus Christ. I am aware, indeed, that the most eminent men of every age and of every class, with whom nothing which I can produce could be at all compared, have already handled this subject. But if you are resolved to receive nothing from me which has not been formerly stated by others, and perhaps to better purpose, I shall be laid under the necessity of maintaining perpetual silence, and of sending you away, for the most part, with empty hands. And yet I would not have you to believe that I have done absolutely nothing. If information which was widely spread, and which could not be found out without toil and inconvenience, has been collected and arranged in a form not inelegant, I have certainly done something for your advantage. And why may I not venture to expect that you will be pleased and instructed by this work, as you assure me that you have been by my former productions? To instruct learned men, or proficients in those studies, is an undertaking which my slender attainments forbid me to attempt. And yet those very persons will not be displeased to see the Students in our University receiving from me those instructions which themselves, perhaps, when young, had learned from their teachers. For what else can they expect from one who pretends to nothing more than to discharge his official duties to you according to the measure of his ability? But no one knows better than you do that we do not confine our whole attention to those elements of Christian doctrine. How often have I exhorted you to peruse with great earnestness and unwearied application all the inspired books both of the Old and New Testament,—and to bring to the examination of them, all that your industry could collect from a careful study of the original languages,—from Hebrew, Greek, and Roman antiquities,—and from those writers of our own time, who have devoted their principal attention to the illustration of Scripture? How often have I complained that, through slothfulness or undue haste, those important aids have been wholly overlooked? How often have I exhorted you not to rest satisfied with what you have learned from common places, systems, summaries, and abridgments, of which you are required to give an account at the public examinations; but, nobly aspiring to higher attainments, to examine with the utmost industry the wisdom of God pervading the whole body of Scripture, not doctrines merely, but histories, ceremonial observances, and prophecies, with astonishing variety? How often, for this purpose, have I lent you the aid of my own hand, of which, if it is not the most skilful that could be desired, I can at least say that it has been honestly and frankly given, and that it need not excite wonder if they who are pleased to follow it shall in a short time outrun their guide? Thus, my young friends, if you begin with God, if you resolutely pursue the work, if, in a word, you are not wanting to yourselves, you ought not to despair of eminent success in an age to which, there is reason to believe, the prediction of Daniel applies, Many shall run to and fro, and knowledge shall be increased. I close with this humble and earnest prayer, that God may make you "perfect, thoroughly furnished unto all good works,"2 and stars of the first magnitude in the firmament of his church. And if I have done you any service, present your prayers for me, a wretched sinner, to our common Lord, through the only Saviour, Jesus Christ. METHOD laid down, Δεήσεις, προσευχαὶ, ἐντεύξεις, ἀιτήματα, υχαριστία, defined and distinguished,—שועה רנה שאלה, explained,—תפלה,—תחנה,—Definition of prayer,—A rational creature only can pray,—In what sense is prayer ascribed to brutes?—Why did the Assyrian king order his cattle to fast and wear sackcloth? Intercession of the Spirit.—The Son of God, even before his incarnation, prayed.—Prayer is to be offered to God only; and with a view to the Divine perfections, and the distinction of the persons in the Godhead.—Is Christ, as Mediator, the object of Adoration?.—All our prayers must have a distinct reference to Christ as Mediator,—Origen quoted.—The poison of Socinian theology exposed.—To render religious worship to any creature is idolatry.—Where Adoration is due, Invocation is also due.—The same kind of worship is due to Christ as to the Father.—Phil. 2:9,, explained.—Prayer is a discourse addressed to God.—What is it to pray with the Spirit? (John 4:24).—What is it to pray with the tongue, the spirit, the mind? (1 Cor. 14:14, 15).—Ought we to pray with an audible voice?.—Vain repetition, (Βαττολογία), must be avoided.—The promise to hear prayer must be understood with certain reservations. The flesh concludes that Prayer is superfluous, that it is useless, and that it insults God.—Those objections answered.—Advantage and necessity of prayer proved. Prayer is incumbent on all men; but cannot be rightly discharged except by a believing and regenerate person. The simplest prayer is the best.—Four things implied in a devout preparation of the mind for prayer.—Prayer must proceed from faith, and must be performed with attention, with fervour, and without ceasing.—After prayer, we must look for the blessing sought for in the use of lawful means.—Time of answering prayer must be left to God.—Do we rise from prayer better men?. Kneeling,, expresses subjection.—Is it a figure of our falling into sin, and of our resurrection?.—The ancients prohibited kneeling on the Lord's day, and between Easter and Pentecost, but superstitiously.—Bowing of the body towards the holy place.—Prostration.—Standing.—Stationary men.—Standing expresses reverence and obedience.—Is Sitting one of the gestures proper in prayer?—Case of David's sitting considered.—Uncovering of the head.—Washing of the hands.—Spreading them out.—Chrysostom quoted,—Kissing of the hands.—Putting off the shoes.—Are any gestures proper to be used by Christians in prayer?—Some prayers require no gestures, such as ejaculatory prayers.—But ordinary, stated prayers, require certain postures.—Augustine quoted.—Gestures must be regulated by time and place. The Hebrews had three seasons of daily prayer.—Morning prayer.—Hence illustrated, Acts 2:15,—Midday prayer.—Evening prayer.—Mahometans pray five times a day.—Ancient Christians had stated seasons of prayer.—Modern Greeks.—Canonical hours. 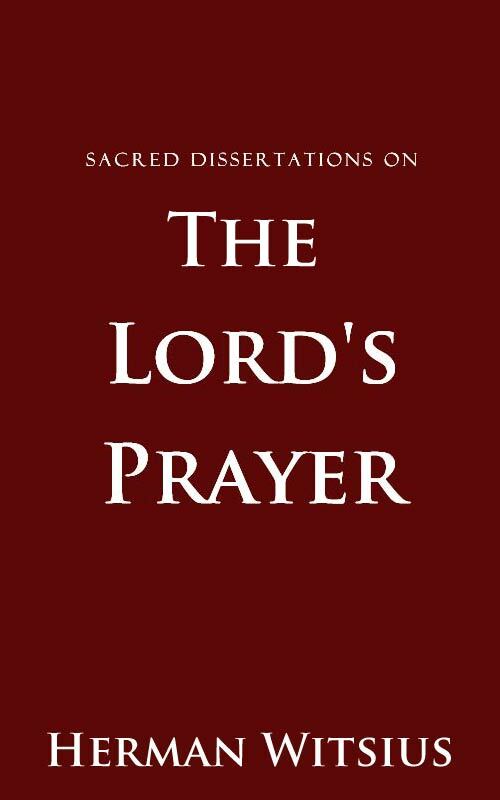 God instructs us respecting Prayer.—Inwardly by the Spirit.—Outwardly by the Son.—The Jews had prayers appointed for the stated hours.—John adopted the custom of prescribing a form of prayer.—Our Saviour accommodated himself to the same custom.—The Lord's Prayer is not merely a copy, but a form.—This appears from our Lord's words; and from the practice of the Israelitish Church; and of the ancient Christian Church,, which added the Lord's prayer to all their prayers,, but did not teach it to Catechumens.—Objections to the use of the Lord's Prayer.—Replies to those objections, 132–142.—The Bogomiles considered all other Prayers to be useless.—Christians ought not to be bound to the use of any human forms,, the use of which arose from ignorance and sloth.—The greater part of the Lord's Prayer is borrowed from forms of prayer used by the Jews.—Excellence of the Lord's Prayer.—Divided into three parts. Every word here is emphatic,—By the Father is meant the First Person of the Godhead; but not to the exclusion of the Son and Spirit.—God is called our Father in respect of Creation.—Regeneration,, and Adoption.—In every age believers were permitted to call God Father.—But greater boldness (παῤῥησία) has been granted to the children of the New Testament.—The appellation Father was considered to be more appropriate than Lord.—Selden's observation.—When we say our Father, it expresses Faith and Charity.—Can none but a regenerate person call God Father?.—God has his throne in the heavens.—Fragments of Orpheus quoted.—Our Father displays himself to this lower world,, but chiefly in heaven.—Even when God dwelt in the sanctuary, his people's views were directed to heaven.—Let us estimate properly the goodness of our Father,, and approach to him with reverence, but with boldness,, and with love,, raising our views to heavenly things.—The course of our life must correspond to the profession of our prayers.—We must learn to despise earthly things in comparison of heavenly.—Seneca quoted. Great familiarity with God is permitted in holy prayer.—When a man appears to pray for God, he prays for himself.—The name of God denotes God himself,, as he reveals himself to rational creatures.—God is Hallowed when he is declared to be holy.—This is done by God himself,, and by the creatures.—Why do we pray to God that his name may be hallowed?.—This petition is the first in order.—Many shew by their conduct that their declarations are not sincere.—Let us sincerely desire that his name may be hallowed.—Epictetus quoted.—Motives to hallow the name of God. The kingdom of God is twofold, universal,, and special.—Under the Old Testament, where it had the form of political government; and was also ceremonial and typical; and spiritual.—The Hebrew teachers refer the fear and love of God to the kingdom of God; but it refers chiefly to the New Testament; and denotes the dignity and freedom of the church.—Why is it called the kingdom of the Father?.—Its form is both outward; and inward.—The KINGDOM of GLORY.—The coming of the kingdom of the Whole Church, by the efficacious preaching of the gospel among the Jews; by the conversion of the Gentiles; by the excision of the rebellious Jews; by the deliverance of the church from the persecutions of the Gentiles; by the reformation from popery; by the destruction of the mystical Babylon; whose destruction is the increase of the redeemed kingdom; and will be followed by the conversion of the Jews and of many other nations; and by an abundance of spiritual blessings.—The coming of the kingdom of God to elect individuals.—Let us confess that we are by nature out of the kingdom of God; and in the most miserable condition; and unable to break our chains; so that the kingdom of God is founded on imposibilities.—Let us seek all our happiness in the kingdom of God, for it is a kingdom of perfect righteousness; of boundless wealth,, (Jer. xxxi. 12, 14, explained); and of uninterrupted tranquillity; and of incomparable dignity. Connection of the third petition with the preceding.—The statement of the petition.—The will of God denotes either his decree; or his commandment.—The enlargement of the Petition.—God's will is obeyed by the starry heavens.—But we ought chiefly to think of angels and redeemed men in heaven.—In what respects is their obedience a pattern?. Is it lawful for us, while we are on the earth, to pray for the same degree of perfection which exists in heaven?.—Let us learn to renounce our own will; for this is the only road to true happiness; which was observed by the Gentile philosophers.—Let us obey the commanding will of God.—Let us propose to ourselves the perfect example of the inhabitants of heaven.—Let us acknowledge our own weakness. The fourth petition has been variously expounded.—By bread is meant all that is necessary for the body.—Ἐπισύσιον, means what is necessary for the preservation of our existence.—Our bread, is that to which we have a right both in the court of heaven,, and in the court of earth.—God gives bread, with regard to possession,, and to use.—What is the meaning of this day?.—Every one prays for others, as well as for himself.—The order of the petition explained.—A holy prayer for temporal benefits tends to the glory of God.—We ought to be content with little.—The prayer for our bread teaches us Industry.—Justice.—Dependence on the favour of God; and Gratitude.—Let us ascribe nothing to our own industry, which God would not tolerate even in heathen nations; but ascribe all our enjoyments to God, and use them cheerfully; but always agreeably to his will,, and for his glory. The statement of the petition.—Debt here denotes sin.—Man's first debt is obedience.—If he fails in this, he incurs the debt of sin.—Every person has many debts, which cannot be denied or evaded,, or expiated by ourselves or by any mortal.—Therefore we ought to pray for forgiveness, which includes many things.—The enlargement of the petition.—Who are our debtors?, and what is the forgiveness of their debts?.—What relation does our forgiveness of debts bear to the Divine forgiveness?.—Sin is the greatest of all evils; and the forgiveness of sins is the greatest happiness,, which is not so easily obtained as many allow themselves to believe.—Earnest exhortation to three classes of persons.—Means of obtaining pardon. He who has God for his friend will have Satan for his enemy,, and will be the enemy of Satan.—Petition divided into two parts.—What is temptation?.—It sometimes arises from the corruption of our nature,, and is then the most dangerous of all.—In what sense does Paul distinguish between himself and the sin that dwelleth in him?.—Sometimes temptation proceeds from Satan,, whose skill and power are great,, though the manner of his operation is imperfectly known to us.—To Satan is added the world.—God is not the author of evil; nor ought the blame of our sins to be imputed to Divine Providence.—And yet in a sound sense God may be said to lead man into temptation.—In what sense do we pray that our Heavenly Father may not lead us into temptation?.—By evil is meant either That which is evil,, or Him who is evil.—What is it to be delivered from evil?.—The necessity of this petition; to which must be added watchfulness.—The example of Alipius held out as a warning.—We must be sober; and bravely resist temptation.—Grounds of consolation. Its authenticity disputed; but defended.—Terms explained.—Its connection with the preceding petition; and with the whole prayer.—The glory of God is the end of all our prayers.—AMEN.